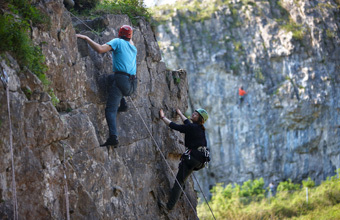 CHEDDAR Gorge has released three new videos where viewers can watch rock climbing, caving and abseiling featuring the Cheddar Gorge X-TREME team. Head of operations and marketing at Cheddar Gorge Maureen McAllister said: "We are now putting a lot more energy and effort into our social media activity, and while we're picking up a lot of followers and friends on Twitter and Facebook, we think our new YouTube channel will help to really showcase the family fun that's currently on offer thanks to our highly trained staff in the X-TREME team. "I think the footage has been able to capture the excitement on offer at Cheddar Gorge in a way that it's never been seen before."